The other therapy and treatment activities come under the supervision of, nurses, scientific or diagnostic laboratories, physiotherapists, residential health facilities, pathology clinics or any other allied health professions. 1. Blockchain, by design, is a distributed database, and therefore its storage space is limited, but it is enough to store let say metadata information. 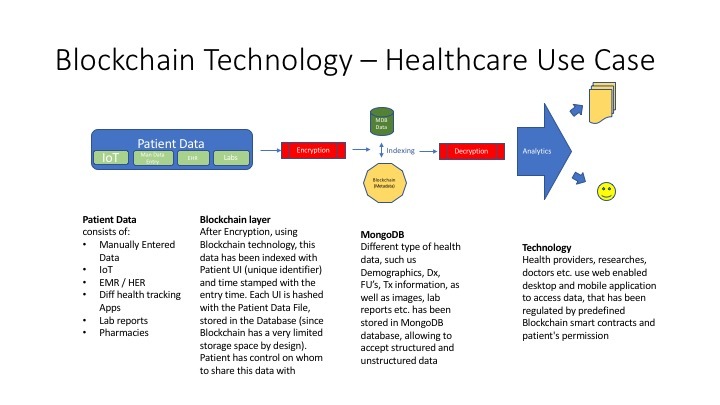 The main data (such as patients records, follow-up files, possible images etc has to be stored off-chain (using for example No SQL MongoDB database, which is perfect for patient records) and linked with Blockchain layer by a hash key, which can’t be altered. 2. Blockchain can help hospitals safely store medical records and share them among multiple networks with authorized doctors or patients, eliminating a need of middlemen, with improved data security and data sharing, which will help to improve accuracy and speed of diagnosis. 3. All medical IoT devices with blockchain technology become a part of the network and communicate with each other directly (for software/firmware update, fix bugs and monitor performance/usage etc). The above Use Case reflects the most common scenario, where Blockchain technology is used in healthcare… and at the same time, this is a very needed tool for any institution, that is involved in health data collection, patient-providers-payers interaction and research/pharmaceutical companies. Each transaction in this workflow has a monetary and quality cost, therefore the goal is to optimize these transactions to reduce cost and improve quality. Also, to utilize our knowledge and partnership with MongoDB – we use MongoDB database with multiple features suitable for the healthcare records. Blockchain in Healthcare- What’s new? ​Blockchain technology holds tremendous potential to rejuvenate the health care industry, placing patients at their center of the ecosystem and betterment of privacy, security, and interoperability of individual data. The technology would bring in a new model for health information exchanges by making electronic medical records disinter mediated, more efficient and secure. While the industry is still rapidly evolving, blockchain provides a playfield for investment, experimentation and proof-of-concept testing. Here are a few ​highlights of bringing in blockchain into the healthcare industry. Privacy and authentication of patient’s health records and guidelines for information sharing regarding the record. Drug journey tracing where in every activity from manufacturer of the drug, wholesalers, retail pharmacists and the patient can be tracked and data can be stored to verify and secure drug product info. This could prove to be a solution for counterfeit drugs. Smart contract implementation where few rule-based methods or protocols are created for the patient’s data access. One-on-one care where patients, doctors, researchers and providers can collaborate and develop exclusive and individualized care. Clinical trials alteration or modification of data from clinical trials and other fraudulent activities can be eradicated.